Former Belarusian presidential candidate Andrei Sannikov and his main campaign aide Dzmitry Bandarenka have been released from prison on the eve of the Christian Orthodox Easter. It looks like the first step in the de-escalation of the worst EU-Belarus conflict in history. It is likely that expectations of Vladimir Putin’s pressure after his re-election contributed more to the long-awaited release of these two political prisoners, rather than the EU sanctions. At least 13 opposition activists still remain in prison and almost nothing prevents Lukashenka from taking new hostages for his dialogue with the EU. The EU needs a long-term and consistent strategy based on the support of Belarusian civil society and increasing contacts with Belarusian officials and businessmen. This will contribute to the long-term transformation of the country much better than sanctions alone. What Finally Prompted Lukashenka to Release Them? Lukashenka pardoned Sannikov and Bandarenka nine days after he had promised to do it against the background of deteriorating relations with the EU. The EU-Belarus relations reached a deadlock in February-March when all EU ambassadors have been recalled to Brussels in a move of solidarity with their colleagues asked by Belarusian authorities to leave the country. Consequently the EU imposed a new set of sanctions against the Belarusian regime, including several Belarusian businessmen and their enterprises. Lukashenka banned dozens of his opponents from leaving the country in a response to that. Now it seems that the war will soon be over. Soft-liners such as the Belarusian Foreign Minister Sergey Martynov and Head of the Presidential Administration Vladimir Makey have already made clear that Belarus wants to return to a dialogue with the EU. However, it is hardly possible that these developments were caused primarily by the EU sanctions. Their cause may be found in the Putin’s return to power in Russia and the end of construction of a new Russian oil pipeline BTS-2. Russia built it specially to lessen its dependence on transit countries such as Belarus and Ukraine. As a result, Belarusian revenues from oil processing and transit may soon drastically diminish. Vladimir Putin is likely to intensify pressure on the Belarusian ruler to privatize Belarusian enterprises, especially oil refineries in Mozyr and Polotsk and the Belarusian potash producer Belkali in Salihorsk. Recently Moscow launched a trade war against Belavia, the biggest Belarusian airliner, to exclude it from making internal flights to Russia. Lukashenka does not expect any significant positive developments on the Eastern front. He has already got what he wanted from Russia and now it is time for him to pay the bills. Intensive development of the Eurasian Union and its supranational institutions may put an end to his unlimited authority. If Belarus has to coordinate its macroeconomic policies with the Eurasian Economic Commission, Lukashenka’s economic model may collapse. Besides, Lukashenka has a lot of other urgent issues to deal with. Belarus will soon need to repay its IMF loan of $3,8 bln and it does not have free financial resources. The EU and Western financial institutions could help solve this problem, but Lukashenka should improve relations with them at first. However, this release is not the end of the conflict. The Head of the EU External Action Service Catherine Ashton called on the Belarusian authorities to release all other political prisoners unconditionally. At the same time Lukashenka evidently hopes for some sticks or at least positive assessment of his recent actions by the EU. For example, he expects that the EU Council will not widen sanctions against his officials on 23 April. If something goes wrong, this rapprochement may end as quickly as it unfolded last autumn. In September the Bulgarian foreign minister Nikolay Mladenov visited Minsk to offer the improvement of Belarus-EU relations. Lukashenka agreed to release 21 political prisoners, but then stopped to do it when Europeans disclosed the information about negotiations with him. If there is no further deterioration of relations, EU ambassadors may return to Minsk next week and all remaining 13 political prisoners may be released before the September parliamentary election. But another problem may impede the speedy release of prisoners: Lukashenka said that he would free only those of them who had written appeals for his pardon. Though he released former presidential candidate Alexander Kozulin without such an appeal in 2008 and Belarusian legislation allows to do this. The most important thing to bear in mind is that Lukashenka may take new hostages for his dialogue with the EU. He has already resorted to this option during the last presidential election when dozens of opposition activists have been jailed on charges of mass riots. A long-term solution is needed. How to Break the Vicious Circle? Some Belarusian experts, such as a scientist Andrei Schumann, think that political prisoners would be granted freedom earlier if there are no EU sanctions. Others, like exile editor of web site charter97 Natalia Radina, are confident that Lukashenka understands only the language of force. It is hard to guess who is right. In March, the EU started negotiations with most of its Eastern partners, particularly Moldova, Georgia and Armenia, on the free trade area (DCFTA) agreements. They intend to promote bilateral trade and modernise these countries in accordance with the EU acquis. This looks like a sound strategy, because the more region is Europeanised, the less authoritarian options Belarus will have. The EU should invest more in the Belarusian economy and its presence in Belarus and should create its lobby inside the Belarusian regime. It should be using its contacts with pro-European Belarusian officials and businessmen who have influence on Lukashenka. Belarus is the unique case for Eastern Europe, so the EU may offer a unique incentive for its democratic future such as the prospect of EU accession if certain conditions are met. Something similar happened in the case of Kosovo and Serbia. European politicians should keep demonstrating their Belarusian counterparts what they lose when they continue to build such an odious regime in the centre of Europe. And of course, the EU should strengthen its support for the Belarusian civil society and youth people, liberalise the existing visa regime and offering new education and job opportunities. Finally, it is not only the EU that should boost the Belarusian transformation. The leading role in the democratisation of the country belongs to its people and those in Belarus who are working with them. 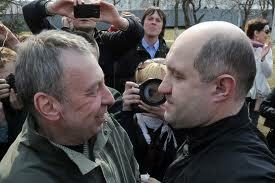 New political prisoners will appear in Belarus sooner or later. This will happen again and again until Belarusian society understands that it should change the way the country is run. But it may take significant time and requires great patience. Only changes in the Belarusian society can help make political prisoners in Belarus a thing of the past. The EU and many support programmes aim at bringing together civil society actors. In their opinion, young people, politically interested actors and activist of non-governmental organisations should meet. Belarusians would consequently understand how democracy works and the Westerners would see themselves that Belarus is a country worth visiting. But this is a somehow naïve vision of things. Women tourists: men who think “Belarus” is the name of a high gloss catalogue with beautiful women. Choose any you like. A German private television network is now broadcasting a series showing a middle-aged man who comes to Minsk to meet girls he met through an agency in the search of the love of his life. TV shows like this strengthen the image of Belarus as a country where beautiful women are waiting for allegedly rich men coming to marry them and offer a better life in Germany. Businessmen. They take direct flights from Frankfurt or Berlin and stay in top class hotels. Neither has any of them as ever been to the sleeping districts where Belarusians actually live nor are they sincerely interested in going there or experiencing the “real” Belarus. Members of partnership and aid committees. Those people are working in German- Belarusian friendship associations. They bring clothes and food to Belarus. If you tell them that people in Minsk are neither starving nor walking around in rags, they will be very astonished to hear that. In their opinion, every child living in Belarus is a “child of Chernobyl”. It is very common to read in German newspapers that “20 children have arrived to Germany to recover from the Chernobyl catastrophe”. Chernobyl children. Those children invited by the friendship associations. Students with a grant from one of the many organisations offering scholarships to Belarusian students. Women who are going to get married to Germans. Men who want to buy a car. This was an especially big group last year before the customs tariff for the import of cars rose. There were many thousands of men going to Germany in order to by second-hand cars. The problem is that those groups of people have totally different expectations when they meet. Consequently, there are no eye-to-eye meetings between the German and the Belarusian civil society. The meetings of friendship associations and partnership committees are based on the assumption that Belarus is an underdeveloped country that needs material support. 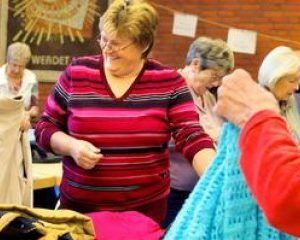 People collect old clothes and tinned food in Germany in order to send it to Belarusian towns. Most of them have not been to Belarus for several years, otherwise they would know by now that nowadays it is difficult to distinguish a German teenager from a Belarusian one by their appearance. Smartphones, flat screens and modern public transport is a part of the everyday life in the Belarusian cities. The partnership committee members think they are doing the Belarusians a favour by sending them their old clothes. However, none of them is looking at the meetings with people from Belarus the other way round: That Belarus is a great country and Belarusians are on a par with them. Of course the living standards here is not as high as it is in Germany, but there are still things that Germans can learn from their Belarusian friends. On the other hand, Belarusians often look down at their German acquaintances. They go to Germany with a feeling of “Germany is a great country, only that there are too many Germans living there”. They think the country is well-organised and approve of the efficiency of their German friends. Then, however, they deplore that things are different than in Belarus: people are coldhearted and they generally lack solidarity with each other. If those partnership committees concentrated on working against stereotypes on both sides, this would be a big step forward in German- Belarusian relations. As it is now, the old scheme of donor and recipient is maintained. No evolution of the work of those committees has happened since the Chernobyl disaster. Only if meetings take place at an equal level, there will benefit Belarus' transformation. It is true that some German and Belarusian NGOs do try to cooperate. Those NGOs that are really doing efficient work in Belarus are not registered here. Unfortunately, German donors shy away from cooperating with non-registered NGOs and try to work with those few that are officially accepted by the Belarusian government. If the international and German donors changed their opinion on this point and took the (manageable) risk to cooperate with an organisation regardless of its formal status, money and energy could finally go to those projects where people meet as equals. Belarus is a great country. It is time to stop seeing it as an exporter of beautiful but will-less women who are happy to get donations from Germany. Belarusian children should go to Germany and take part in exchanges without being labelled "children of Chernobyl". They are not pale impoverished children but smart young people who know mathematics ten times better than the German children they meet. And: Germany is a great country, too. Germans are not as bad as their reputation.